Week 7 Sleeper Picks: Can Aaron Rodgers’ Backup Steal The Show? Never let anyone tell you the NFL is a predictable league. The league has become a whirling dervish of upsets, injuries, and breakout performances. None of these make it easy to set your fantasy lineup, but they highlight the appeal of fantasy sleepers. Who would've guessed that Chris Thompson would be outperforming LeSean McCoy? Or that two Minnesota receivers would be standing taller than Mike Evans, Julio Jones, T.Y. Hilton, and OBJ in PPR scoring? Right now chaos is running amok. That makes it seem like a good time to take a shot at the league's more inconspicuous talents. They just might be part of the surprises Week 7 has in store. Check out the full slate of fantasy sleepers this season. Brett Hundley has some mighty big shoes to fill, but consider the Packers WR trio his insulated socks. 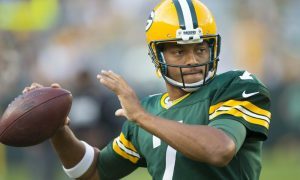 First, let's state the obvious: Brett Hundley is no replacement for Aaron Rodgers. You shouldn't expect Hundley to match the outrageous level of production the future Hall of Famer put up week in and week out. With a full week to prepare as the starter, throwing to Jordy Nelson, Davante Adams, and Randall Cobb though? At Lambeau Field? Yeah, I like this kid's odds of producing as one of the week's fantasy sleepers. Especially given that he's been learning from Rodgers for three years and has some wheels on him that should give him a safe floor. For all the talk of late about how the Saints defense is coming into its own, let's not forget that Dennis Allen's group just allowed Matthew Stafford to post his first 300-yard game of the season. Granted, they also picked him off 3 times and forced him to fumble twice...but that was in the Superdome. Good luck duplicating that inside Lambeau. And despite Hundley throwing 3 picks himself after getting the call, one of those INTs was his receiver's fault, another was due to the freakish athleticism of Harrison Smith, and the other was during a desperation drive with the Packers down by two scores and 15 seconds left on the clock. Don't expect to see multiple interceptions this week in Lambeau. While most folks are focused on the battle between Mike Gillislie and Dion Lewis for Bill Bellichick's heart (and snap count), James White has been quietly building a nice little season over in his corner of the room. As the de facto pass-catcher in New England's backfield while Rex Burkhead sits out with a rib injury, White is currently on pace for 88 receptions and more than 900 scrimmage yards for the year. Burkhead's impending return surely dampens some of the former Wisconsin Badger's mojo, but don't expect Burkhead to force his way back into the mix right away. So long as White sees a handful of targets this week, he should gobble up yards against an Atlanta defense that hasn't performed especially well against the run this year. Oh, and did I not mention this is the same unit White gashed for 3 touchdowns in Super Bowl LI? I'm not saying that's going to happen again this Sunday, but I'm counting on him to at least break his end zone drought by the game's end. That would be enough to solidify him as one of the week's top fantasy sleepers. Emmanuel Sanders' temporary replacement should have a hefty workload in Week 7. Despite being on the field for more snaps than any of his fellow receivers in Week 6, Bennie Fowler managed a meager 3 receptions for 21 yards off of 8 targets. Any receiver seeing that much playing time and that many opportunities deserves a second look though. 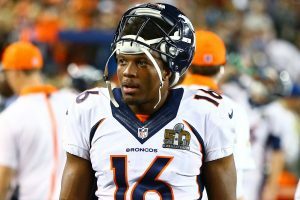 Especially now that target hog Emmanuel Sanders has been officially ruled out for Sunday's meeting with the Chargers. L.A.'s group has been kind to enemy wideouts all season long, and Fowler is now the No 2 guy opposite Demaryius Thomas, who should keep defenders busy. Trevor Siemian has looked shaky at best through the last three games, but will try to rebuild his confidence in a winnable road matchup. Look for the young QB to get the ball out of his hands early with underneath throws, many of which could go to Fowler in 3 WR sets. Here's a surefire recipe for fantasy success: Start Buffalo's tight end, whomever that may be. Tyrod Taylor is clearly infatuated with his bigger-bodied receivers in the middle of the field, and with Charles Clay nursing a knee injury, O'Learly now slides into the top of the receiving depth chart. The Bills will have to exhaust whatever firepower they have to keep pace with Tampa Bay, who proved they can move the ball downfield with or without Jameis Winston in the huddle. To be fair, the Bucs have been stingy against tight ends for the most part, but the sheer volume coming O'Leary's way should make up for that. His only real competition is Zay Jones, who has thus far looked more like a parkour enthusiast than an NFL receiver. 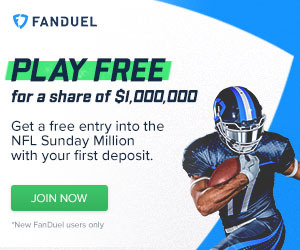 Make sure to get those lineups set before the slate of games kick off tonight. Check back regularly for more exclusive content from FK and as always, follow us on Twitter for extras: @_knuckleheads and @JakeTrowbridge. Category - Fantasy Football Sleepers - Week 7 Sleeper Picks: Can Aaron Rodgers’ Backup Steal The Show?